Prof. Tom Perera Ph. D. and David Hamer Ph. 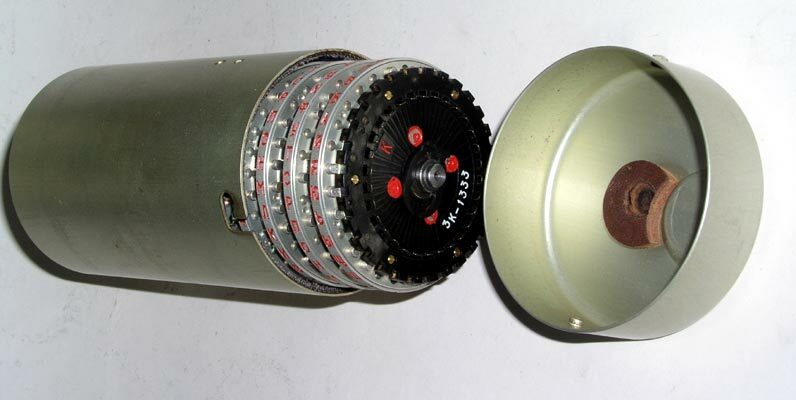 D.
The Russian Fialka Cipher Machine was used during the Cold War era and manufactured in two versions: The M-125-MN and the more complex M-125-3MN/-3MP3. 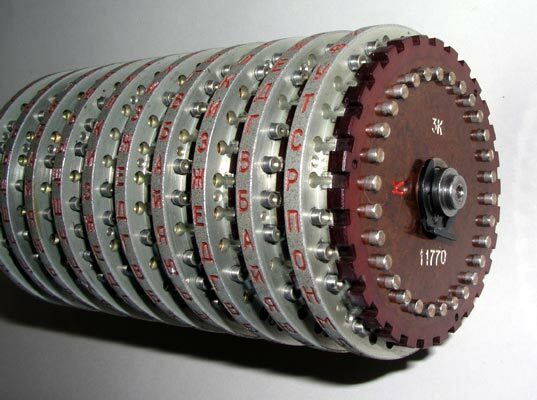 The Fialka is a 10 rotor cipher machine that is similar in basic design to the German WW-2 Enigma, the Swiss NEMA, and other multiple-rotor cipher machines. It does, however, differ from other cipher machines in several very significant ways. The Fialka itself is described in much more detail in other sections where you will also find a digitized German language version of its instruction manual. This page deals exclusively with the ROTORS. The Fialka rotates each of its 10 rotors in a direction that is opposite to that of each neighboring rotor. 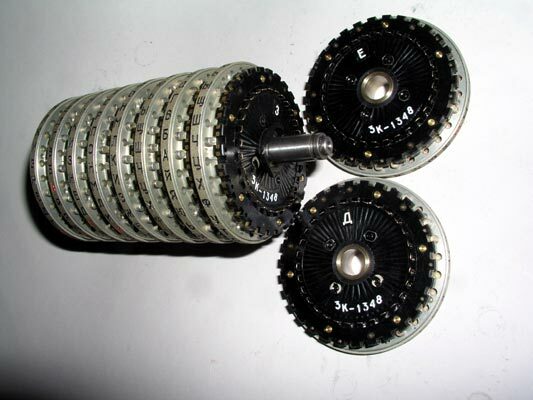 Most other cipher machines have rotors that all turn in the same direction. The rotor advance blocking pins that control the rotation of individual rotors are described and the locations of all pins for all rotors are given in tables below along with sample rotation data. The Fialka can use either a simple, non-adjustable set of rotors or an extremely unique and complex set of multi-adjustable modular-wiring-matrix rotors that allow a very large number of internal wiring variations. These simple and complex rotor sets are described in detail below and their internal wiring data is presented in comprehensive tables. 2. Descriptions and Photographs of the Non-Adjustable Rotor Sets. 3. Wiring Data for the Non-Adjustable Rotor Sets. 4. Rotor Advance Data for the Non-Adjustable Rotor Sets. 5. Descriptions and Photographs of the Multi-Adjustable Removable-Wiring-Maze Rotor Sets. 6. Adjusting the Multi-Adjustable Removable-Wiring-Maze Rotor Sets. 7. Wiring Data for the Multi-Adjustable Removable-Wiring-Maze Rotor Sets. 8. Rotor Advance Data for the Multi-Adjustable Removable-Wiring-Maze Rotor Sets. Every Rotor in this SERIES has a "3K" imprinted into its input side. This SERIES contains both Non-Adjustable and Multi-Adjustable Removable-Wiring-Maze Sets of rotors. At least some of these "3K" SERIES rotors are known to have come from Poland. Every Rotor in this SERIES has a "6K" imprinted into its input side. This SERIES contains both Non-Adjustable and Multi-Adjustable Removable- Wiring-Maze Sets of rotors. At least some of these "6K" SERIES rotors are known to have come from the former Czechoslovakia. Since each of the unique SERIES above came from a different country, it is possible that the machines in each country used their own unique SERIES of rotors. It is also possible that the unique rotor SERIES were used by different military organizations. It will be interesting to see whether other SERIES of Fialka rotors are discovered. 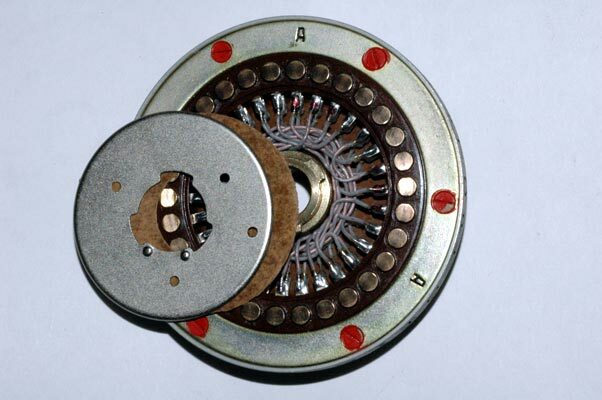 A rotor SET contains one rotor for each of the first 10 letters in the Russian Alphabet. The rotors in a SET are labeled A (the first letter) through K (the tenth letter). There are two different SETS of 10-rotors that fit into the Fialka. The rotors in one SET are very simple and they are non-adjustable. Each rotor has a fixed wiring maze connecting the 30 input connections to the 30 output connections. This non-adjustable SET will be described first in the pages below. The other 10-rotor SET consists of multi-adjustable rotors. Each rotor in this SET has both an adjustable external ring setting with 30 possible positions and a modular wiring matrix that can be removed and reinserted in 30 different orientations. This modular wiring matrix may also be reversed and reinserted in 30 more orientations. This allows each rotor to have a total of 60 unique and different internal wiring layouts. The modular wiring matrix may also be inserted in any of the other 9 rotors in 60 orientations. 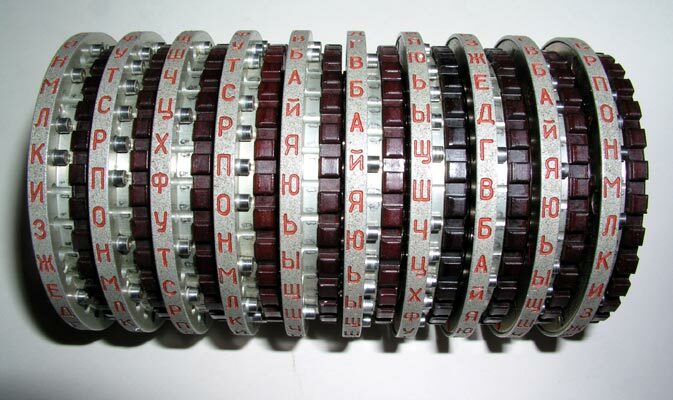 This set consists of 10 rotors that are identified by the first 10 letters of the Russian Cyrillic Alphabet. This set contains rotors in the "3K" Series as you will see from the photographs. Each rotor is imprinted with "3K". The 10 rotor stack of non-adjustable rotors showing the 30 spring loaded input contacts and the retaining clip that keeps the rotors on the shaft. 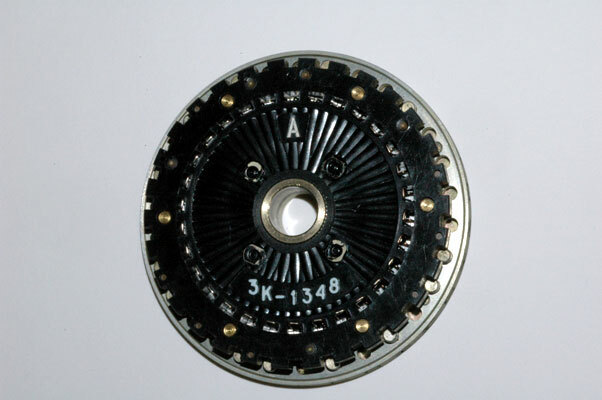 This is one of the "3K" Series Rotors. You can see the "3K" imprinted on its input side. These rotors came from Poland and were part of a series that has totally different wiring from the "6K" Series found in the former Czechoslovakia. The 10 rotor stack with the retaining clip removed and rotor "K" slid off the shaft. The 10 rotor stack with all but rotor "A" removed from the shaft. 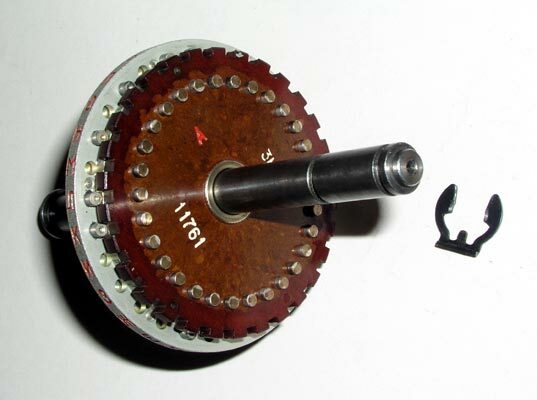 The input contact (right) sides of all 10 non-adjustable rotors after removal from the shaft. The output contact (left) side of a non-adjustable rotor on the shaft. The output contact sides of all 10 non-adjustable rotors after removal from the shaft. The shaft with the retaining clip in place to allow 8 rotors to be used instead of 10. A special filler with contacts on both sides is used to fill in the remaining space. 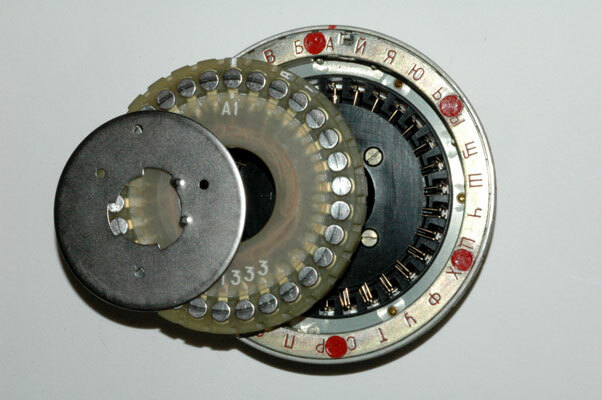 Each rotor has 30 contacts that are identified by 30 letters of the Cyrillic Alphabet. The letters are stamped around the outer ring of the rotor. The contacts receive electrical voltages from the input wheel on the right side of the Fialka and are therefore called the input contacts. These contacts are on the RIGHT side of the rotors when they are inserted into the Fialka. The RIGHT side of the rotors face the input wheel which on the far right side of the Fialka and which carries the voltages from the keyboard to the rotor stack. 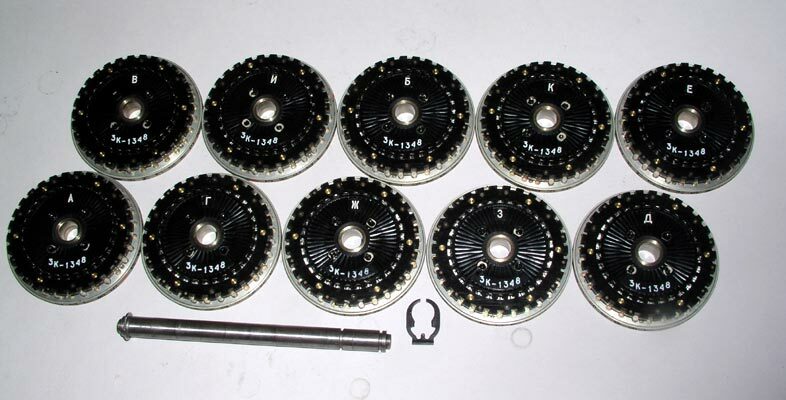 The Thirty Input Contacts for the Non-Adjustable Rotor "A". The heavy lubricating grease lubricates the contacts and eases rotation. The other side of the rotor contains the 30 output contacts that pass the electrical voltage out of the rotor and LEFT to the next rotor in the stack or to the reflector at the far left. 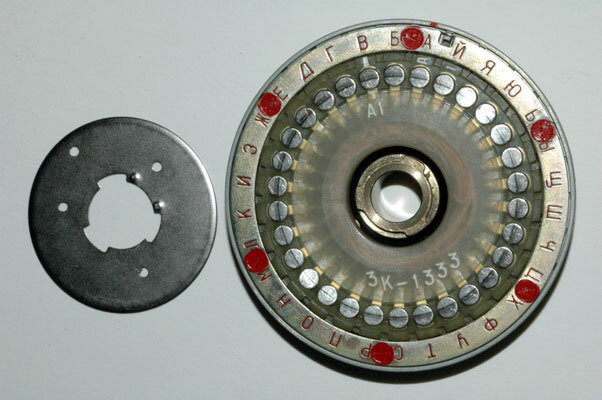 Each of these output contacts is identified by a letter from the Russian Cyrillic Alphabet that is stamped on the outer ring of the rotor. 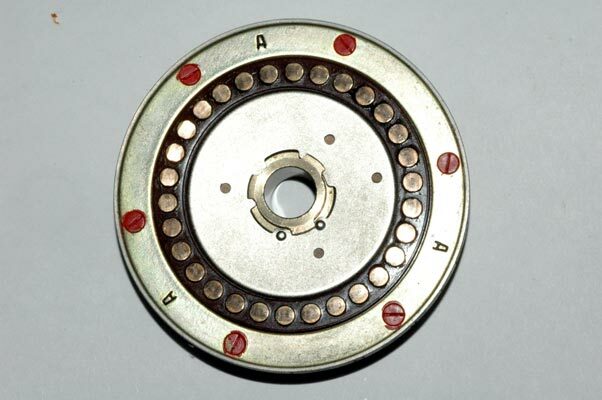 The Thirty Output Contacts for the Non-Adjustable Rotor "A". The non-adjustable rotors can be disassembled to allow access to the wiring maze but no changes can be made to the maze. To access the wiring, this metal disc is rotated until it releases the brass central shaft as shown in the next photograph. The metal disc has been rotated until it releases the brass central shaft. The metal disc and the insulating fiber washer have been moved aside to reveal the hand-wired wiring maze. Access to the wiring maze makes it easier to repair any cold-soldered joints. The complete wiring maze is shown in this photograph. Here is a closer view of the wiring maze. Click here for Series "6K" wiring data from Paul Reuvers. The 30 wired connections between the 30 input contacts and the 30 output contacts are fixed and can not be changed. The Cyrillic letter stamped on the outer ring and associated with each contact is also fixed and can not be changed. The exact wiring between the 30 input and output connections is given for each of the 10 rotors in a table below. This table shows the Cyrillic and the corresponding numerical identifier for each of the 30 INPUT contacts in a column on the left side of the table. 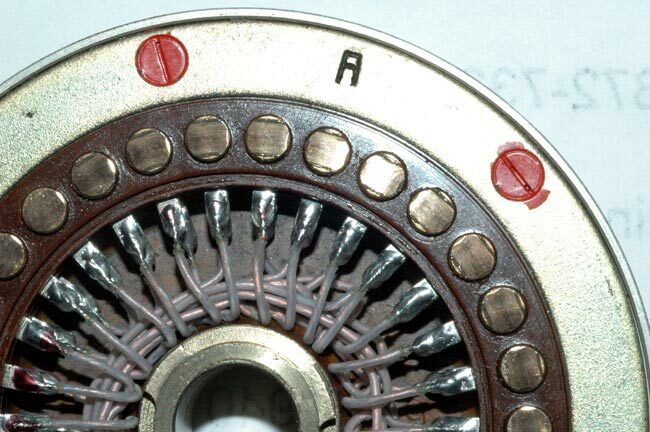 The OUTPUT contact that is fixed-wired to each of the input contacts is given by the number in the table under the Cyrillic letter identifying each of the 10 rotors. To convert this number back into its corresponding Cyrillic letter, just use the column on the left. Ezequiel Guerrero Romero B. Sc. has created tables of the wiring of all Multi-Adjustable Fialka Rotors in the 3K and 6K -series with their wiring maze reversed that you can view by clicking here. The actual rotation of the rotors is controlled by the placement of the metal pins adjacent to each of the contacts. These pins block or lock-out the drive mechanism and determine which rotors will not rotate. This photograph shows several of the pins and several of the un-pinned locations. 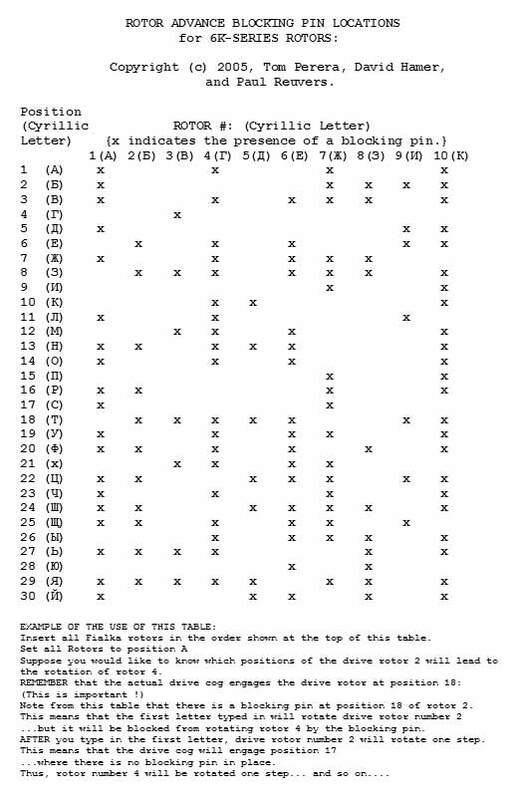 A detailed table showing the locations of all of the pins in all of the rotors may be found below. Although all known Fialka rotors have exactly the same rotor advance blocking pin placements it is possible, with a considerable amount of effort, to change the placements. These pins can be removed from the rotors and inserted into other holes but it is quite difficult to do this. It does not appear to be a real adjustment of the rotor but rather an assembly convenience and perhaps a provision for a major engineering revision. To remove the pins, the 6 screws holding the outer ring plate must be unscrewed. Each screw is covered with red paint that both makes it difficult to unscrew, and also reveals any attempts to do so. After the outer ring plate is removed, the pins drop out of their cylindrical holes and can be repositioned. This is so difficult and complex that for field and operational use, it can safely be assumed that these pins are always to be found in the positions shown in the table. Copyright � 2005: Tom Perera Ph. D. and David Hamer Ph. D.
This table gives the locations of the advance blocking pins for the Non- Adjustable and Multi-Adjustable Fialka Rotors of series "3K". 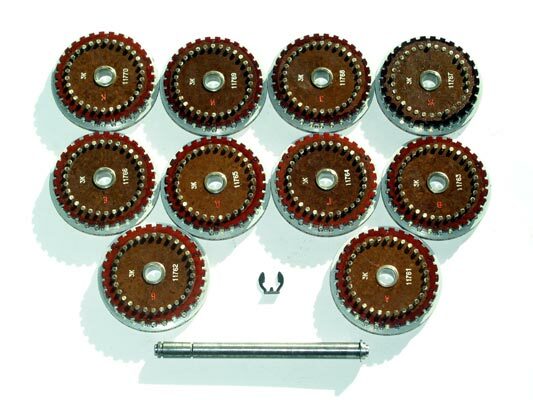 These pins determine whether the rotor will advance or not as each letter is typed in. These pins block the advance of rotors by blocking specific advance cogs underneath the rotor stack. 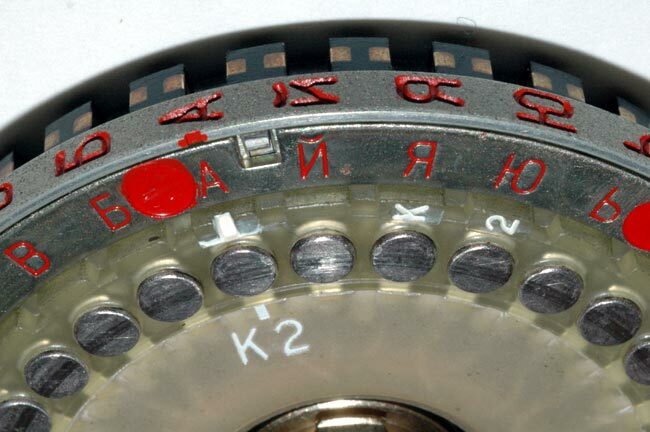 The advance blocking pins (marked with an "x" for each rotor in the table) are located at the position identified by the Cyrillic letter and contact number shown in the column on the left. 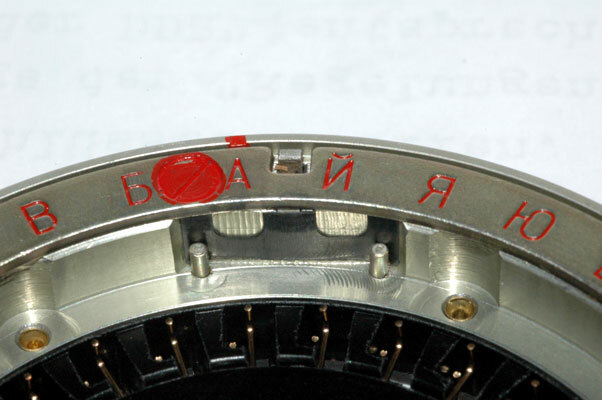 EXAMPLE: For rotor "A" there is no rotor advance blocking pin in position 1 which is marked with the Cyrillic letter "A". There is, however, a blocking pin located at position 2. Please also note that the Non-Adjustable and Multi-Adjustable rotors are identical ONLY when the multi-adjustable rotors are set to their overall 'BASE' setting. In the overall BASE setting, the outer lettered ring is set so that the Cyrillic letter "A" is Adjacent to the Cyrillic letter "A" on the main rotor frame. 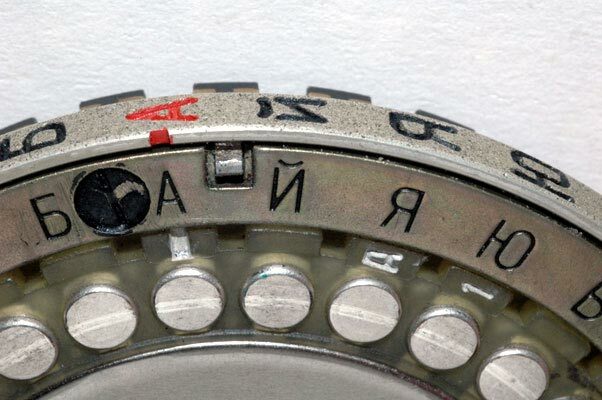 Then the internal modular wiring maze is removed and placed back into the rotor so that its index mark points to the Cyrillic letter "A" and so that its side "1" is facing outward. Please see the accompanying text for an explanation of the special multi-adjustable modular-wiring-maze rotors. 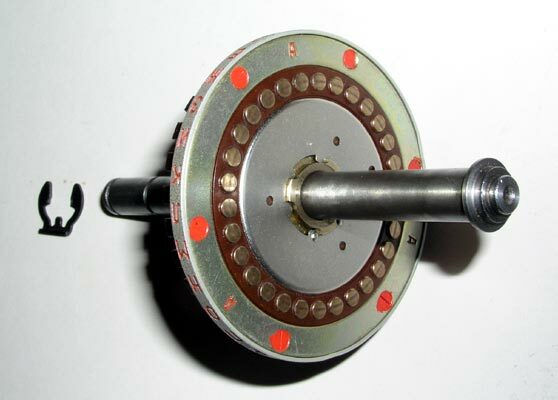 The actual advancing of rotors 2, 4, 6, 8 & 10 is activated by a drive cog that engages the rotor at position 18 (When the rotor is set to the "A" position). An advance blocking pin in the rotor in this position (position 18) will block the rotation of any of these even-numbered rotors to the RIGHT of that rotor. As the rotors rotate, the place that the advancing cog engages the rotor changes accordingly. Rotors 2, 4, 6, 8 & 10 Rotate their upper letters AWAY from the keyboard. Their rotation is driven by rotor 2 which drives rotors 4, 6, 8 & 10 in that order. 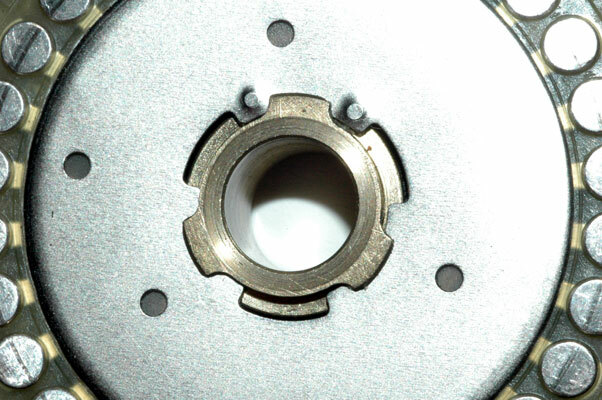 For these 5 rotors, ANY Rotor Advance Blocking Pins existing in the drive slot of a rotor to the LEFT of a given rotor will prevent it from rotating. In other words, a Rotor Advance Blocking Pin blocks the rotation of any of these 5 rotors to the RIGHT of the rotor that has the pin. Rotor Advance Blocking Pin locations are given in an accompanying table. The actual advancing of rotors 1, 3, 5, 7 & 9 is activated by a drive cog that engages the rotor at position 21 (When the rotor is set to the "A" position). An advance blocking pin in the rotor in this position (position 21) will block the rotation of any of these odd-numbered rotors to the LEFT of that rotor. As the rotors rotate, the place that the advancing cog engages the rotor changes accordingly. Rotors 9, 7, 5, 3 & 1 Rotate their upper letters TOWARD the keyboard. Their rotation is driven by rotor 9 which drives rotors 7, 5, 3 & 1 in that order. 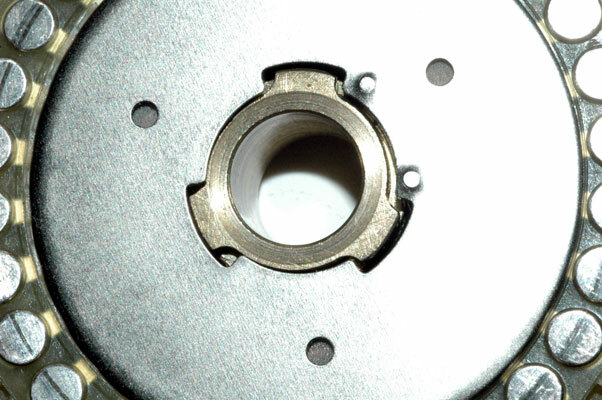 For these 5 rotors, ANY Rotor Advance Blocking Pins existing in the drive slot of a rotor to the RIGHT of a given rotor will prevent it from rotating. In other words, a Rotor Advance Blocking Pin blocks the rotation of any of these 5 rotors to the LEFT of the rotor that has the pin. Rotor Advance Blocking Pin locations are given in an accompanying table. Then All 10 rotors were manually rotated to position "A". (The state in which all rotors are set to position "A" is shown in the table as 1, 1, 1, 1, 1, 1, 1, 1, 1, 1 in the top row of the table. Finally, 20 letters were typed into the Fialka. Each letter caused some of the rotors to rotate. 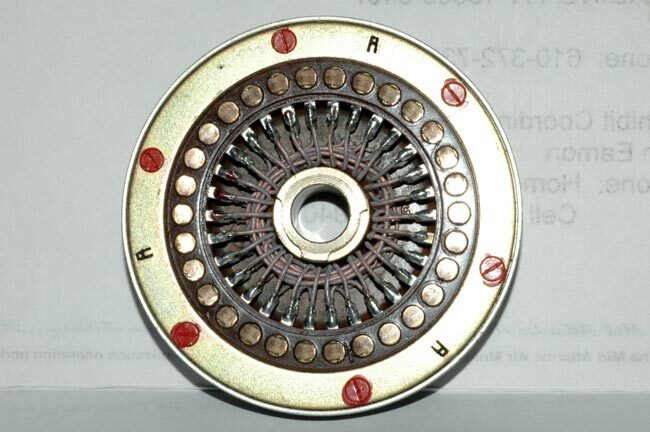 The position that each of the 10 rotors had reached after each letter was entered is shown in the table by a number that corresponds to a Cyrillic Letter on the outer ring of the rotor. These numbers may be converted into their Cyrillic letter equivalents by using the column on the right side of the table which is just placed there as a convenience in making the conversions. Suppose you insert all Fialka rotors such that the rotors are in the order shown at the top of the table. Suppose you set all Fialka rotors to the letter "A" position. Suppose you would like to predict the rotation of rotor 4 as you type in 5 letters. 1. 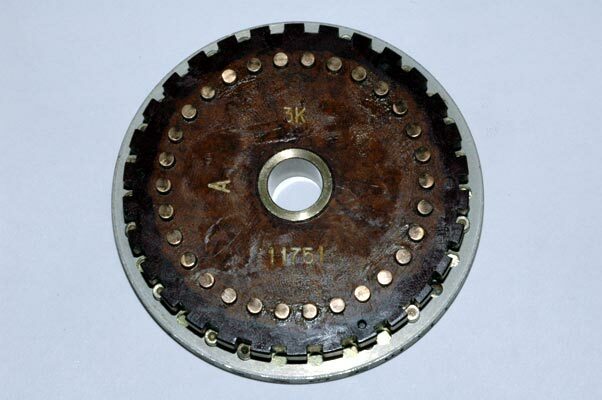 Remember that the drive cog for rotors 2, 4, 6, 8 & 10 is located at position 18 (Very Important). 2. Look at the table that shows the locations of the rotor advance blocking pins. 3. Note that there is an advance blocking pin in location 18. 4. This means that when you type in the first letter, the drive wheel "2" will rotate but the advance blocking pin will prevent rotor "4" from being turned. 5. 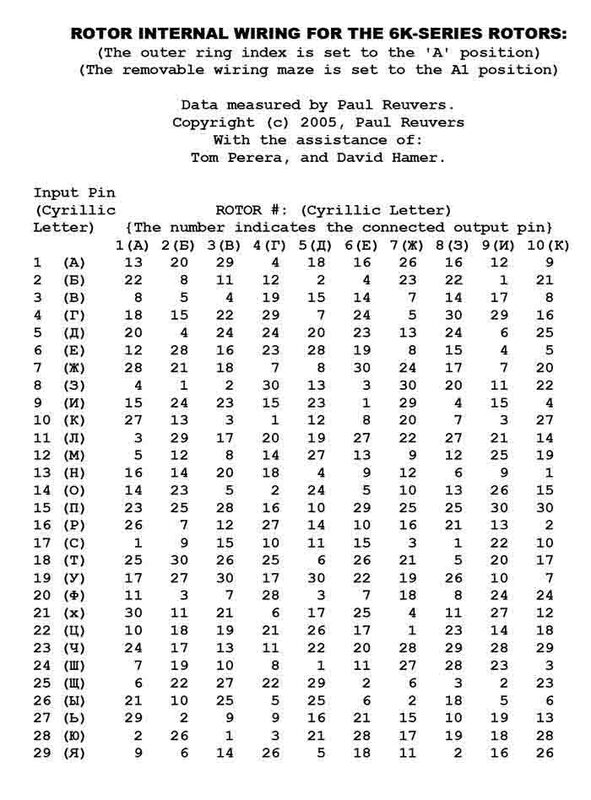 You will see in this table that rotor "4" does not rotate as the first letter is typed. 6. Now type in another letter. 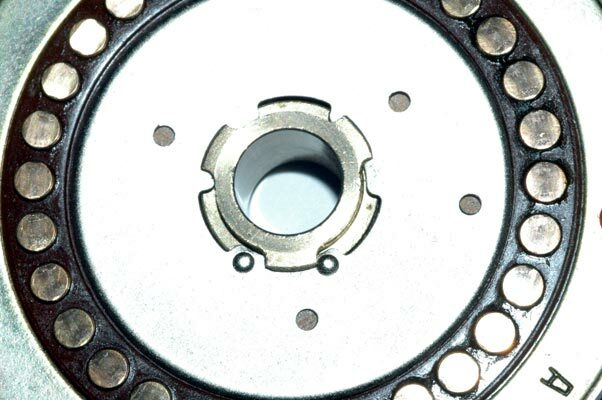 The drive rotor, number "2" has moved so that the drive cog engages position 17 and the table shows that position 17 has an advance blocking pin in place preventing rotor 4 from turning. 7. Typing in two more letters advances the drive rotor "2" 2 more positions but rotor advance blocking pins are in place in positions 16 and 15 so rotor 4 still does not turn. 8. Now, type in another letter. 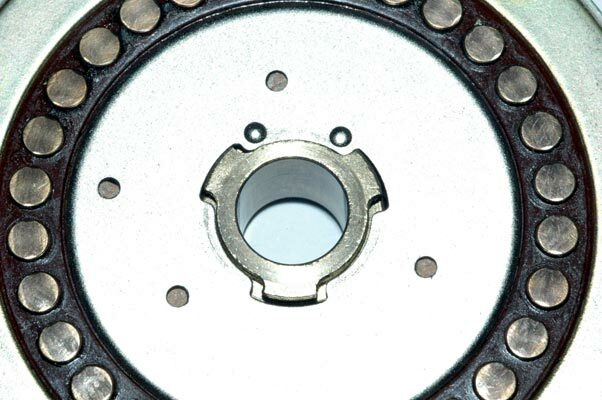 The drive cog now turns the drive rotor at position 14 where there is NO rotor advance blocking pin. Without a drive advance blocking pin in place, rotor "4" is also rotated and turns to position 30. (This means that the drive advancing cog is now located at position 17.) Since the table shows that rotor 4 has a drive blocking pin in position 17, it does not allow rotors 6, 8, or 10 to turn.) Drive blocking pins prevent the even numbered rotors to the right from turning. This set contains rotors in the "3K" Series as you will see from the photographs. Each rotor is imprinted with "3K". Wiring and rotation data for both the "3K" and "6K" series is given below. Sets of rotors may be installed in the Fialka or carried in this special protective metal container inside the cover. A multi-adjustable rotor set is shown in the container. 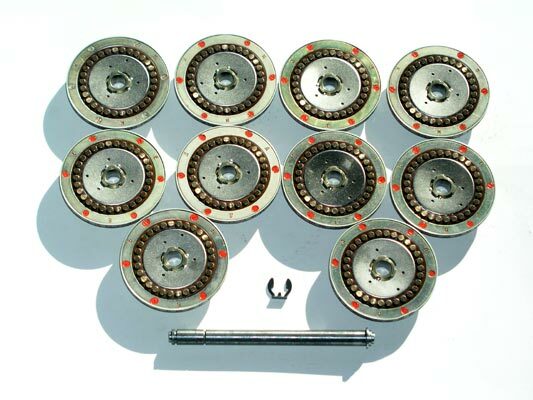 This is a complete set of "3K" series Multi-Adjustable Removable-Wiring-Maze rotors after removal from the Fialka or from the protective metal container. The retaining clip that holds the rotors on the shaft is shown on the right side of this picture. 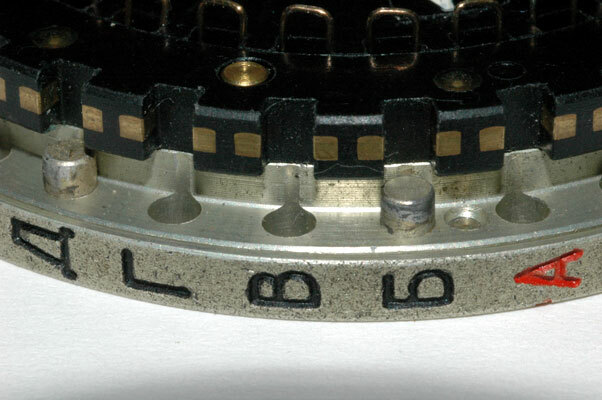 This is a "3K" series rotor as indicated by the "3K" inscribed on the input side. These "3K" series rotors are known to have come from Poland. 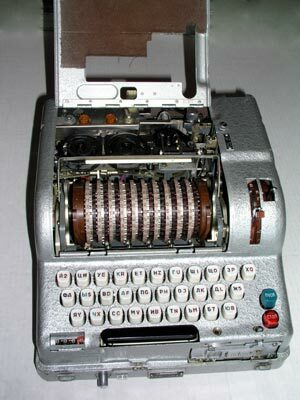 Another series that has a "6K" inscribed on its input side is known to have come from the former Czechoslovakia. This suggests the possibility that these two rotor series were used in different countries or by different military organizations. The input contact side of all 10 Multi-Adjustable Modular Wiring Maze rotors after they have been removed from the shaft. This photograph shows the special retaining clip location that allows 8 of the rotors to be mounted on the shaft instead of 10. An accessory spacer fills in the rest of the rotor stack width. 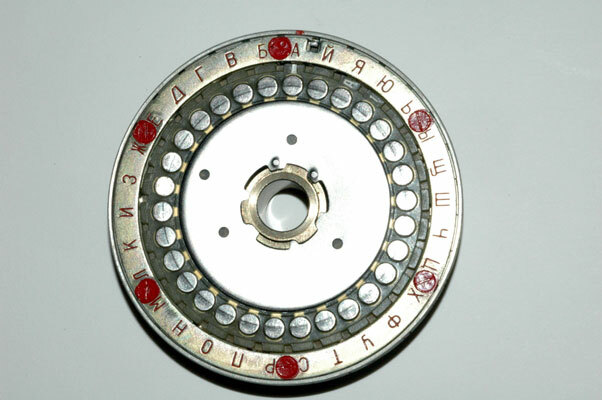 Each rotor has 30 contacts that are identified by 30 letters of the Cyrillic Alphabet. They receive electrical voltages from the input wheel on the right side of the Fialka and are called the input contacts. These contacts are on the RIGHT side of the rotors when they are inserted into the Fialka. The RIGHT side of the rotors face the input wheel which on the far right side of the Fialka and which carries the voltages from the keyboard to the rotor stack. The Thirty Input Contacts for Multi-Adjustable Rotor "A". The output contact sides of all 10 Multi-Adjustable Modular Wiring Maze rotors after they have been removed from the shaft. The other side of the rotors have the 30 output contacts that pass the electrical voltage out of the rotor and LEFT to the next rotor in the stack or to the reflector at the far left. 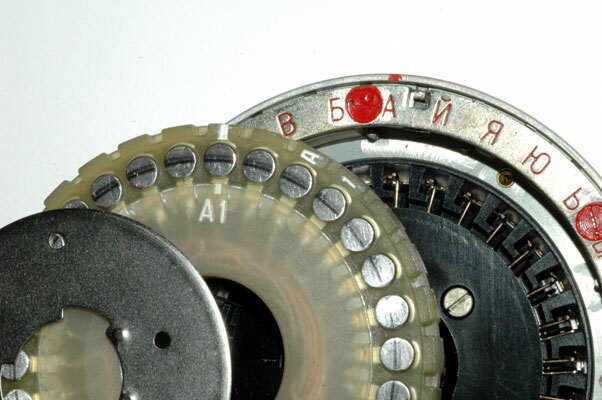 Each of these output contacts is identified by a letter from the Russian Cyrillic Alphabet. If you look closely at the output contacts you may be able to see the "A 1" that identifies side 1 of the removable modular wiring maze for rotor "A". 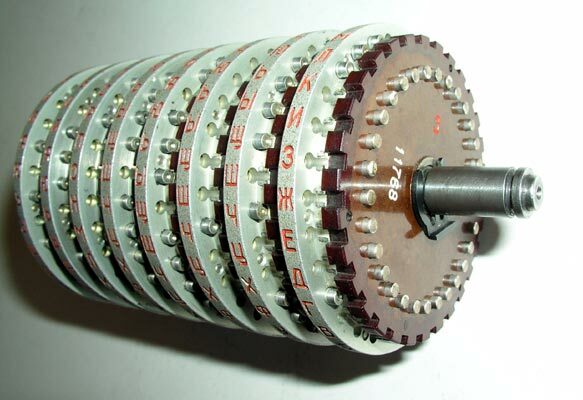 The Thirty Output Contacts for Multi-Adjustable Rotor "A". In this picture, the Cyrillic letter "A" has been set to the index mark which, as you will see from the next photograph, is also the outer ring setting letter "A". When the outer ring is set to this position, it is said to be in the BASE ring setting position. This is a closer view of the BASE ring setting in which the outer letter "A" is set across from the inner letter "A". The outer ring is rotated after pressing inwards on the small tab that is visible in this picture. This pin CAN ONLY BE PRESSED INWARDS AFTER THE REMOVABLE WIRING MAZE HAS BEEN REMOVED. This is a view of the spring loaded locking pin on a different rotor. Again, the outer ring has been set to the BASE ring setting in which the outer letter "A" is set across from the inner letter "A". In this photograph, the retaining disc has been released from the metal tabs on the central brass cylinder. In this photograph, the retaining disc has been moved aside to reveal the modular wiring maze. Note that the maze has a Cyrillic letter and a number. The Cyrillic letters on the mazes correspond to the letters of the 10 rotors BUT, ANY MAZE may be inserted into ANY of the 10 rotors. You are looking at side 1 of the modular wiring maze "A". It can be flipped upside down to reveal side 2. Please also note that the modular wiring maze has a white line index mark that is pointing to the Cyrillic letter "A". WHEN THE INDEX MARK ON SIDE 1 OF THE MODULAR WIRING MAZE IS FACING OUTWARDS AND POINTING TO THE CYRILLIC LETTER "A", THE WIRING MAZE IS IN THE "BASE" POSITION. When the maze AND the ring setting are in the BASE position, the rotor is in the OVERALL BASE SETTING and it exactly corresponds to the like- lettered non-adjustable rotor. In other words, when multi-adjustable rotor "A" is set to this position, it has exactly the same wiring and rotor advance blocking pin settings as non- adjustable rotor "A". These wiring and rotation data are given in tables above for both the "3K" and "6K" series rotors. In this photograph, the modular wiring maze has been removed from the rotor. This is a close view of the index mark on the modular wiring maze. The maze is oriented so that side 1 is facing outwards. The large figures "A1" show that you are looking at side 1 of modular wiring maze "A". The small figures A 1 printed around the outside of the modular wiring maze are put in that position to allow the letter and number of the maze to be read even when the metal disc holding the modular wiring maze is locked in place. In this photograph, the index mark of the modular wiring maze has been set to the Cyrillic letter "B" position. In the following photograph, the modular wiring maze has been removed from rotor "K" and flipped upside down so that side 2 is facing outwards. The index mark on the modular wiring maze is pointing to the Cyrillic letter "A". NOTE: This is the setting of adjustable rotor "K" that is shown in a special column on the right side of the rotor wiring data table. The heading of this special column is: REVERSED K. This means that multi-adjustable rotor "K" has had its internal modular "K" wiring maze flipped to the position shown in this photograph. This special wiring data set in the right column is shown to try to help clarify what happens to the wired relationship between the 30 input contacts and 30 output contacts when the removable modular wiring maze is reversed in the way shown in this photograph. Of course, there are a total of 60 possible orientations of the removable modular wiring maze within the rotor but it is hoped that showing the data for this one orientation will help researchers extrapolate all of the other possibilities from this known wiring. 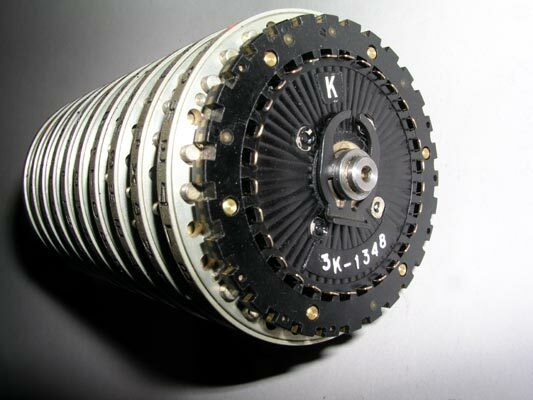 This photograph shows rotor "K" with its removable modular wiring maze FLIPPED OVER OR REVERSED so that side "2" of the maze is facing outward and its index mark is pointing to the letter "A" position. THIS IS THE SETTING OF ROTOR "K" THAT IS REFERRED TO AS "REVERSED K" IN THE 'SPECIAL' COLUMN ON THE RIGHT SIDE OF THE ROTOR WIRING TABLE. The wiring data shown in the special right column of the table show the connections between the input contacts and the output contacts when the modular wiring maze is reversed in rotor "K" so that it is in this position. It is important to remember that the wiring mazes from one rotor can be removed and reinserted into any other rotor in 60 different orientations. Please notice that the modular wiring maze has both an index mark and a Cyrillic letter and a number 1 or 2. The modular wiring maze can be inserted into a rotor with the index mark pointing to any of the 30 Cyrillic letter- identified locations around the rotor. The modular wiring maze can be inserted into the rotor with either side 1 or side 2 facing up. The "BASE" positioning of a modular wiring maze is when the index mark points to the Cyrillic letter "A" and side 1 is facing outward. 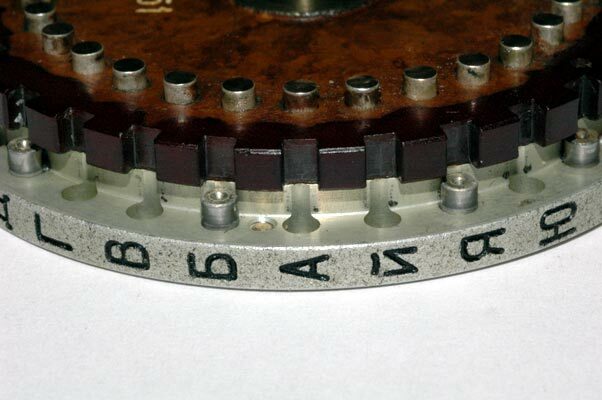 In addition to the 60 possible insertion positions of the modular wiring maze, remember that these multi-adjustable rotors can also have their outer Cyrillic letter ring rotated to any of 30 positions. When letter "A" on the outer ring is adjacent to letter "A" on the rotor, the rotor is set to the BASE ring setting. The exact wiring between the 30 input and 30 output connections for the 10 multi-adjustable rotors set to the OVERALL BASE position is identical to the wiring of the non-adjustable rotors and the data for the "3K" series is shown in the previous wiring data table. When the Multi-Adjustable rotor is set to the base position with the modular wiring maze index pointed to the Cyrillic letter "A" and side 1 facing out AND when the outer letter ring is set so that the Cyrillic letter "A" on the outer ring is adjacent to the Cyrillic letter "A" on the output face of the rotor, the rotor is in its OVERALL "BASE" position. These tables show the Cyrillic and the corresponding numerical identifier for each of the 30 INPUT contacts in a column on the left side of the table. 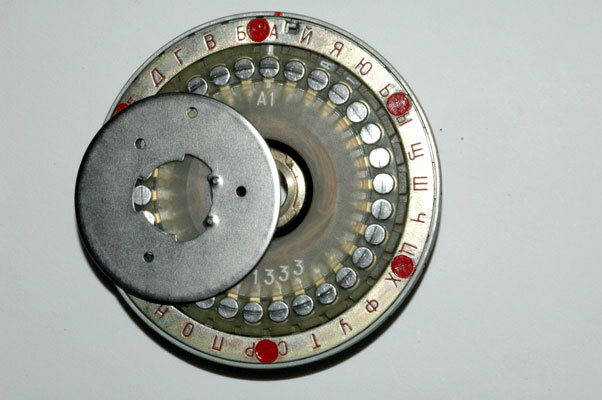 The OUTPUT contact that is wired to each of the input contacts is given by the number in the table under the Cyrillic letter identifying each of the 10 rotors. To convert this number back into its corresponding Cyrillic letter, just use the column on the left. Redundant Note: The table applies to both the Non-Adjustable rotor set and the Multi-Adjustable rotor set AS LONG AS THE MULTI-ADJUSTABLE ROTORS ARE SET TO THE BASE POSITION. One final column is presented in the table (for the "3K series only) to show the internal wiring of multi-adjustable rotor "K" when the rotor ring setting is first set to the base position and then the modular wiring maze is flipped upside-down so that side "2" is facing out and the index mark is adjacent to the Cyrillic Letter "A". With this wiring data it is possible to determine by extrapolation, the exact internal wiring data for the multi-adjustable rotors for any of the 60 possible insertion positions of the modular wiring maze. The actual rotation of the rotors is controlled by the placement of the metal pins adjacent to each of the contacts. These pins block or lock-out the drive mechanism and determine which rotors will not rotate. This photograph shows several of the pins and several of the un-pinned locations. A detailed table of the locations of all of the pins in all of the rotors in series "3K" and series "6K" may be found above. Although all known Fialka rotors within a 'series' have exactly the same rotor advance blocking pin placements it is possible, with a considerable amount of effort, to change the placements. These pins can be removed from the rotors and inserted into other holes but it is quite difficult to do this. It does not appear to be a real adjustment of the rotor but rather an assembly convenience and perhaps a provision for a major engineering revision. To remove the pins, the 6 screws holding the outer ring plate must be unscrewed. Each screw is covered with red paint that both makes it difficult to unscrew, and also reveals any attempts to do so. After the outer ring plate is removed, the pins drop out of their cylindrical holes and can be repositioned. This is so difficult and complex that for field and operational use, it can safely be assumed that these pins are always to be found in the positions shown in the table. This is a close view of the rotation advance blocking pins for multi- adjustable rotor "A". Sample rotation data for all 10 rotors of series "3K", for the first 20 letters typed into the Fialka are shown in the table above. Within a 'series' they are identical for non-adjustable rotors AND multi-adjustable rotors set to the base position. The other sections in the FIALKA MENU above describe and display the general introduction, the Model M-125-MN, the much more complex model M-125-3MN, the rotors, power supply and cables and the cover and accessories.